It is a fact that I am a rather disorganised person. This blog is a good example of that, there’s no fixed time in my week allocated to ensuring that I regularly manage to publish posts. Thus, the blog can go months without a post, then have a run of posts at weekly intervals. That probably isn’t going to change, but my lack of organisation is not the sole reason for the irregular posting. There’s only a limited amount of content I can put out, and the stories I have are generally too lengthy to be completed in one sitting (so they get left in the drafts folder for months or even years). I’ve decided to try and resolve that second issue by broadening the scope of the blog. Rather than just talking about real-life transport (and important but off-topic issues), starting with this post I will also cover my model-railway project(s). I have a dream to construct a rather large layout, but currently I have next to no space to set up a model railway. After many years hoping to find space, I have given up and decided to build something small and try to squeeze it in anywhere I can. This will also give me a chance to practice and improve my (currently very limited) modelling skills in order that, if I ever get onto my big project, I have a chance doing the idea justice. Anyway, the starting point for this ‘something small’ is one of three baseboard frameworks of 2-by-1 timber made by my father for the layout I had in our previous house (the other two frameworks will remain in storage for the time being). I cannot find the legs the baseboards once stood on, maybe somebody used them to build something else. The first order of business therefore was to design and build some new legs. Design-wise, the big problem was how to attach them to the framework; initially I planned to have them hinge up under the board but it was pointed out to me that the bracing of the framework would get in the way of the screwdriver when I tried to attach the hinges. Outside hinges couldn’t be attached at one end, due to some damage on the timber, and they would have put the legs outside the framework. Back to the drawing board. I want the layout to be portable, meaning fixed legs are undesirable. With hinges ruled out, the new plan was detachable legs (held on by nuts and bolts). Using some 2-by-1 timber found in our ‘random bits of wood’ storage area, a pair of legs (each formed of two verticals with two horizontals as bracing) were assembled over the weekend of 12-13th November 2016. The timber was very hard, sawing it to length was a pain and efforts to screw the components together were thwarted. The screws heads were too soft, with the slot for the screwdriver getting mangled (this happened both with brass-coloured screws and silver-coloured ones). After a few screws, the drill bit used for making the pilot holes snapped and screwing was abandoned in favour of nailing. Once the legs had been made, the structure was loose-assembled (we did not have bolts yet) and it was found the structure was not sufficiently stable; the framework would wiggle back and forth. Quite a disappointment, but I had an idea to solve it. The idea involved more 2-by-1 timber, and the remaining lengths from the stash I had found were not long enough. That didn’t matter too much since I was intending to go wood-shopping anyway; the chipboard tops from the old layout have probably been thrown away, so some ply to form the new surface was on my shopping list. Progress would however have to wait until the shopping had been done. So, I now have at least one follow-up post to write, but I don’t know yet whether this modelling series will run for very long. Yesterday morning (15th November 2016) at about 08:32, BBC radio 4 had an interview with Bernie Sanders, one of the Democratic party’s candidates who were in the running to fight the recent presidential election in the USA. Of course, it was Hillary Clinton who the party eventually put forward, but back to the BBC’s interview. Asked what he feared now that Donald Trump has been elected as the next president. First, he replied that he was afraid racism and sexism would rise, but he didn’t stop there. Importantly, he continued to voice the very same fear that I have; that Trump believes climate change is a hoax. Mr Sanders was very clear on this, climate change is NOT a hoax and Trump’s failure to recognise that frightens him very much. Yet Trump’s dangerous stance was hardly presented during the campaign, and the interviewer yesterday asked whether Mr Sanders thought of Donald Trump as a fascist (he didn’t), and whether he thought he would have had a better chance of beating Trump than Hillary, but there was nothing more on the climate. Similarly, the coverage of the UK general election last year and national assembly for Wales election this year barely featured the various party’s policies on greenhouse gas emissions. It appears that much of the media won’t talk about climate change. That’s a very dangerous silence, yesterday’s interview also asked how Trump could be stopped on issues like women’s rights, given that the republicans control Congress and President Trump will be able to appoint people to the relevant court. Bernie Sanders answered that they would need to educate and mobilise millions of people, to make the political cost of implementing such measures too expensive for the republications to go ahead. Mobilise and educate millions; that would be rather difficult if you cannot reach them because the media refuse to transmit the messages. It is time they gave the climate the coverage it needs. After a pleasant afternoon watching, and riding on, trains, my ‘short holiday’ started to go downhill. I’m picking up the story where I left off, in a car on the M4, having been met by family members at Port Talbot. There’s no doubt about it, motorways are very dull ribbons of dreary tarmac (and/or concrete), apparently without exception. Actually, that’s a good question, can anyone think of an exception? We did of course leave the motorway eventually, but not until after stopping for dinner. Thus we were in darkness as we headed up the A420, negotiated the Oxford ring road and the A418 past Aylesbury and onto the A505. Unfortunately, if there’s any travel more boring than miles of motorway then it is probably night-time motoring. Of course family chat and, occasionally, the radio can partly relieve the monotony, and so can navigation, but these don’t really make up for not being able to see what you’re passing. I think we were all relieved when we finally arrived at our booked accommodation, after crossing the A5 and twice passing the M1. No, I didn’t get us lost, the written directions used for the last few miles to our destination were written as though we were coming up the M1 from London and I didn’t want to risk finding my own route with just a road atlas (I might have tried it if I had been equipped with an Ordnance Survey Landranger map). While helping to keep me sane, navigating was perhaps also a little stressful; there’s often an argument between at least two occupants of the car over the best route. On this occasion though, there was at least general agreement that the motorway network didn’t really suit our journey, much like the rail network it radiates out from London and I don’t think any of us fancied the M25. Anyway, so why are we here, in self-catering accommodation not far from the M1? Why would anyone want to come here? Although the accommodation was of a reasonable standard, the noise of the motorway could be heard if you stood outside and my mother wondered why somebody would come on holiday here. Our reason was that my brother had educational commitments in Milton Keynes, and the rest of us were just taking advantage of the trip to see a few things. I had a stab at answering Mum’s question by taking quick look at the map, the obvious tourist attractions were Woburn Abbey and its Safari Park. Apparently, none of us were interested in the latter, but the Abbey was one reason for my elder’s interest in the visit. Another of their reasons, and one I’d come along for too (though not the main reason) was Bletchley Park. The next day, after dropping my brother off, we drove down towards Didcot to one of the other attractions which had drawn me, ‘Pendon Museum’. This ‘museum’ features three model railways, one a very early example of the craft. The other two are much more recent, at least one is still under construction, and very impressive with detail extending to the interior of buildings and a birdwatcher observing a bird of prey. These model various parts of the steam-era Great Western Railway, although they are intended to capture a snapshot of buildings and scenery typical of the areas concerned rather than being models of a particular location (the buildings in the model village don’t all belong to the same real-world village). We decided the Oxford ring road (with its many roundabouts) was no more appealing in daylight than it had been at night, so went back to Bicester via a different route (which involved the M40). Bletchley Park introduction entrance. Image from ‘The Hub’ (fit-out contractor) website. On the third day (Monday), we made the much shorter journey to Bletchley Park. We had thought we may move on to somewhere else afterwards, but our visit took us through until it was time to collect my brother again. We didn’t even visit the adjacent national museum of computing, which contains more of the code-breaking machines created on the site, although it wasn’t fully open that day anyway. Interestingly, the entrance to Bletchley Park’s introductory exhibit had a railway theme. The word ‘entrance’ was in white text on a midland-red background, while the doorways beneath it had imitation railway-carriage slam-doors. 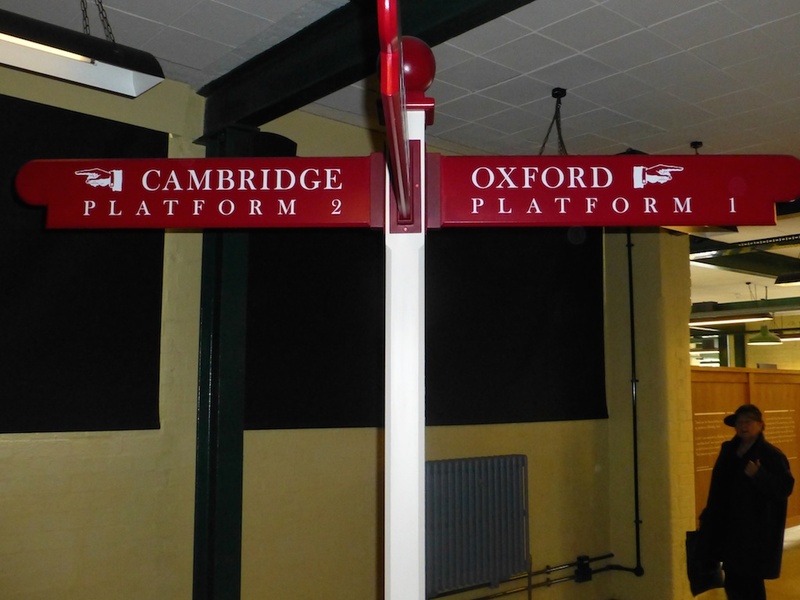 Also present was a four-way ‘fingerpost’ sign, also in midland-red, pointing to ‘platform 1 for Oxford, platform 2 for Cambridge, platform 3 for Glasgow and platform 4 for London. I doubt such a sign actually would have existed on a station, but railways from Bletchley to the four places in question certainly did exist. Sadly, you cannot currently make a reasonably direct journey from Milton Keynes to Oxford by rail today, because the central section of the Oxford-Cambridge ‘Varsity Line’ has been closed since 1967; so when we headed off to visit Oxford on the fourth day we couldn’t leave the car in Milton Keynes with my brother. The line which would have taken you to Cambridge still exists as far as Bedford, but beyond that it is also gone. One of the many Milton Keynes roundabouts we traversed on our excursions in the Oxford direction was called, I kid you not, ‘Bottledump Roundabout’. Perhaps unsurprisingly, it was liberally scatted with discarded plastic bottles, presumably thrown out of passing cars. Whether the bottles were there first and this inspired the name or vice-versa I do not know. The railway between Bletchley and Oxford is now to be reinstated, but we were several years early. So, to avoid the Oxford traffic, we parked at ‘Bicester Village’ station, which until the recent complete rebuild was ‘Bicester Town’. 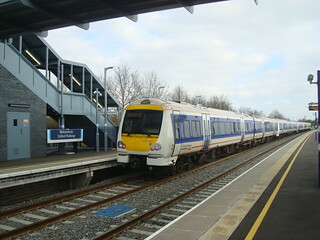 Previously, ‘Bicester Town’ was served by a shuttle to Oxford, but now Chiltern Railways have had a new section of track built to allow services from London Marylebone to Oxford, running through ‘Bicester Village’ station. This project wasn’t complete either, enhancements work was still taking place near Oxford so we had to transfer to a bus for the final leg into Oxford from Oxford Parkway station. Of course, it is not only Chiltern who have significant changes planned on their part of the network. The electrification work of parts of the Great Western Main Line (GWML) will see Intercity Express Programme (IEP) class 800 bi-mode trains introduced from next year (2017). Thus we get to my principle reason for coming on this trip; the five class 180s currently with the franchise will be moved to Grand Central, probably by the end of 2017, as the 800s arrive. Having never been on a 180, I was keen to get a ride on one to compare them with the related class 175 units we have in Wales while I had the chance. I left my elders and boarded my first 180, 180108 on a Cotswolds line service to Kingham. From there, I returned to Oxford on another class 180. I was pleased to discover that the interior of standard class did indeed have much in common with the class 175s, with ample legroom even in airline-style seating. Rather strangely however, especially on a line with short platforms like the Cotswolds line, the first-class carriage on the 180s (class 175s are standard-class only) was not one of the driving vehicles at the ends. 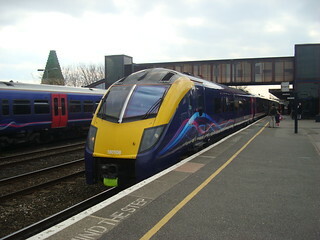 Instead, one standard-class coach was isolated on its own at one end, with the adjacent coach being the first-class one. Given that I’ve read standard-class ticket-holders are not even allowed to stand in the vestibules of first class coaches on Intercity 125s, I wonder what happens if somebody in the isolated standard class coach wants to alight at a short platform where that carriage is off the end of the platform. One of the four standard class carriages on the 180, perhaps the isolated one, also seemed to have fewer bays of four around tables than the others. Another feature that the class 175s lack but can be found on a 180 is the mini-buffet/cafe. This is really quite small, with just one of the main external windows blanked out by it, though it didn’t appear to be open. I’m not sure if First Great Western bother with it anymore. Back in Oxford, I rejoined my mother and grandmother for a walk around parts of the city; admiring the architecture of some of the old university buildings and other heritage structures. One of these was a church whose tower is of Saxon origin (it is close to the building in the photograph, click that to go to my Flickr where you should be able to find photos of the Saxon tower too). 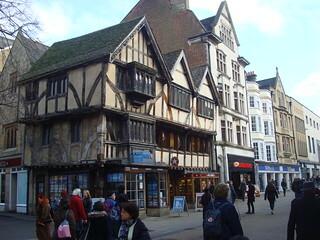 It was then back via bus, train and car to Milton Keynes, to collect my brother, and to our ‘holiday’ accommodation. We return to Wales in the final instalment of this mini-series of blog posts, which I did eventually get round to writing.